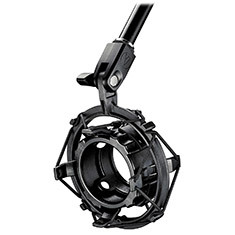 The Audio-Technica AT8484 is a broadcast microphone shock mount designed to be used with the BP40. It attenuates noise, shock and vibration transmitted through microphone stands and features an inner shock mount ring which rotates to engage ball bearings to lock mic securely. Compatible with 5/8-27" threaded stands.